Emirates, which is based in Dubai, prides itself on flying one of the youngest fleets of planes. But newer is not always better since many of the latest aircraft squeeze even more coach passengers into less space. When we learned that Emirates had introduced service from New York's JFK Airport to Malpensa in Milan, Italy in 2013 and was offering a low introductory economy-class rate, we jumped at the opportunity to travel to Italy, one of Europe's most romantic countries. 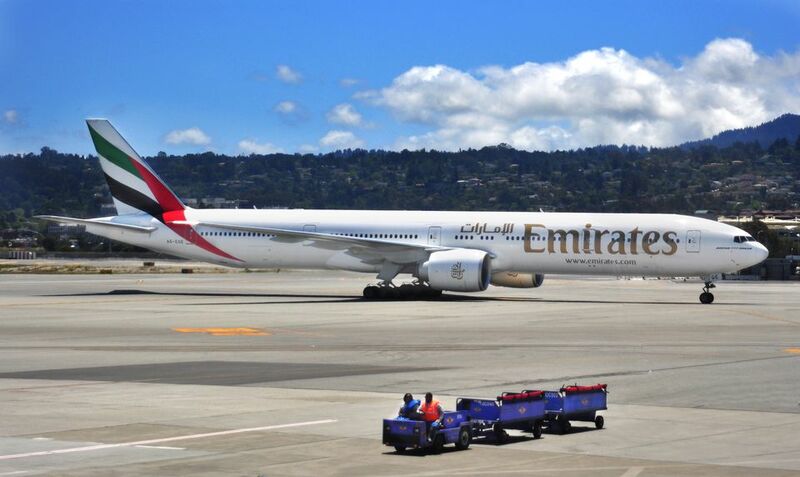 Although Emirates has purchased a number of A380 Dreamliners, our plane was a modern 777-300ER that extended back some 50 rows with its coach seats ten across in a 3-4-3 configuration. It is a massive, fuel-efficient model with quite a tight seat configuration in coach. Economy-class seats are as narrow as those on short-hop Southwest Airlines' 737s: 17 inches, as opposed to an 18-inch width on the A380. Despite the narrowness of the seats, they are nicely upholstered. But the tight cabin configuration does make for a close ride with the passenger next to (and in front of) you. Emirates foodservice draws a distinct line between premium-class passengers and the rest of the plane. The Emirates Lounge at JFK for business and first-class is an outstanding place to have a meal before boarding one of their flights. (Not that you won't be graciously served onboard if you travel in those sections.) The advantage of dining here, rather than on a late-night flight, is that you can go to sleep after takeoff rather than waiting for food service. Culinary pleasures in the lounge include plates of smoked salmon and ramekins of beef and mushroom sauce topped with puff pastry. A constantly refilled steam table and a gondola with dessert plates tempt. There's also unlimited Champagne and wine, excellent service, and even complimentary toothbrushes and toothpaste in the restroom. En route to Milan in Economy on our eight-hour flight, we received for dinner a box with a slice of microwave pizza. Prior to landing, passengers were offered breakfast, which included a cold fruit cup and salty spinach frittata. This is where Emirates excels. Its ICE system consists of a large screen built into economy-class seat backs. Using either a controller or the touchscreen, passengers can select from hundreds of current and popular movies, great music, even audiobooks to queue up and entertain themselves in flight. All of the A380 and some Boeing 777 aircraft have free Wi-Fi and in-seat power. Try to select mid-week flights departing during less-busy times. On our return flight, only 80 out of 300 seats were occupied, and it was a completely different experience. In the back of the 777 are a few rows of two, rather than three, seats across. Don't pick the last row (across from the toilet), but the rows ahead of it. For couples, these are a small luxury where no one need suffer in the middle seat. Check in online before you leave for the airport. If departing from the United States, you won't be issued a boarding pass but you may be able to wait on a shorter line at the airport to obtain one than passengers who have not done so. As is common in the travel industry, the writer was provided with discounted services for review purposes. While it has not influenced this review, TripSavvy believes in full disclosure of all potential conflicts of interest. For more information, see our Ethics Policy.